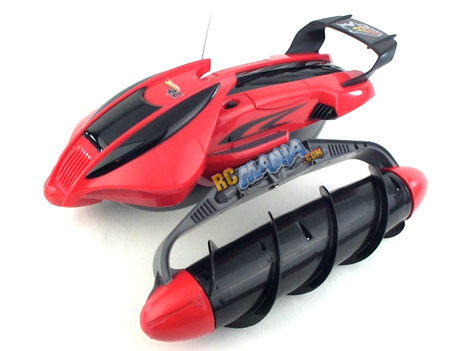 If you've followed RC Mania for a long time, you may be having a bit of deja vu right now. It was 2006 when I first reviewed a vehicle that looked like the one pictured above. Thn called the Tyco Terrain Twister (Tyco & Hot Wheels are both Mattel brands), the vehicle defied classification and single-handedly kicked off the "Other" section of our reviews, for which it has lent its image ever since. I was very excited to hear that a new Terrain Twister would be coming out in 2012, but I was surprised to see that it's not similar to the original; it is the original, with not one single change that I can see, right down to the 1990s copyright stamp on the charger. Check out the full review video to see if my thoughts & feelings about this classic have changed with time. This was a fun experience! The Terrain Twister remains a one-of-a-kind thing with all of the appeal today as when it was first released in 2004. It's fascinating just to watch its bizarre form of locomotion, and the ability to drive right into water and then operate as a boat, without any specialized transformation, is phenomenal. Unfortunately, though the Terrain Twister has returned with all of its strong points, it also brings back the weak ones. Controlling the thing on land really can be difficult and even downright confusing.